The Friends of Esquipulas and the parish of St. William have long supported and participated in the work of the Casa Materna in Matagalpa, Nicaragua. In recent years, we have paid the annual salary of one of the Casa’s full time staff. 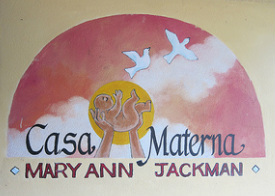 The purpose of the Casa Materna is to reduce maternal and infant mortality rates. In this global "silent epidemic," a maternal death occurs every minute of the day. In Nicaragua alone, a maternal death occurs every 38 hours.The Casa Materna provides a short-term residence in the city of Matagalpa, offering food, shelter, education, transportation and support for high-risk pregnant women 1-2 weeks before and after childbirth. While the births take place at the Regional Hospital in Matagalpa, the services of the Casa Materna allow the expectant mothers to be close to this needed medical attention which would otherwise take hours or days to reach from their rural homes. Women in the town of Esquipulas and its surrounding 33 rural communities are served by Casa Materna. Matagalpa is located in one of the poorest regions in Nicaragua with an extremely high maternal mortality rate (infants 23:1,000 births; mothers 170:100,000). Only 74% of births are attended by a skilled medical provider. Only 50% of children complete primary school. 40% of population has no access to health services. In 21 years of work with 15,000 mothers, the Casa Materna has only experienced two deaths. The community of St. Williams participated in the annual Mothers' Day Fund Raiser. St. Williams members took prayer cards and envelopes to make a donation to the Casa in honor of their own mothers or significant women in their lives. The donations for this went directly to the Casa. Last year the fund went for a new ambulance. This year the funds went for new ultrasound machine for the Casa clinic. Kitty Madden from the Casa presented a Eucharist communion reflection at Mothers' Day liturgy. This annual visit keeps us connected to the Casa in a very personal way. Sewing Circle made 24 maternity gowns with guidance from Casa Staff and the seamstress at the Casa. This is the second year of the Sewing Circle. The Sewing Circle consists of 6 seamstresses. Mama's Hip has informally adopted the Casa as their international outreach. In 2012 we had an initial introductory program about the Casa . This year the store set out a donation jar to collect change. Mama's Hip send their donations directly to the Casa. Staff is holding a monthly Spanish Speaking Play group. Participant's donations are being sent directly to the Casa. An Intentional Community at St Williams has informally adopted the Casa. Five of the thirteen members of this community have visited the Casa while participating in Hand to Hand Ministry in Nicaragua. This intentional community focuses on the Casa during the Christmas season sending their donations directly to the Casa. Members attended the first National Circle of Support gathering in Detroit MI September 2013.